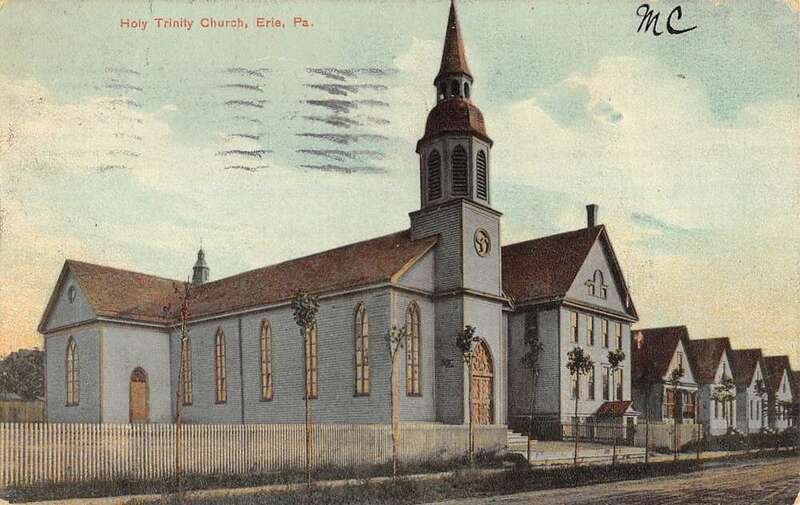 Undated postcard of the original Holy Trinity Church Built 1903. Rectory is to the right. ​The Polish population of Erie was growing rapidly in 1895, and Bishop Tobias Mullen was approached to organize another Polish parish. This plan was temporarily set aside in order to help build a new church in St. Stanislaus parish, for it was necessary to have the support of all Poles to succeed in this project. St. Stanislaus was finally completed in 1898. In 1901, there were 800 Polish families in Erie. The idea of a new parish was again revived. Members of the Thaddeus Kosciuszko Society, chartered as Group 224 of the Polish National Alliance, were proponents of a new parish. A special meeting was called on October 5, 1902, and a committee was selected to present a petition to the new Bishop, Most Reverend John Fitzmaurice. This committee consisted of Mr. Adalbert Skibinski, Mr. Anthony Donikowski, Mr. John Czarnecki, Mr. Francis Nowak, Mr. John Nowak, and Mr. John Kubeja. Six lots on the corner of 22nd and Reed Streets were selected as the site of the future parish. At a meeting on November 16th, the Society voted to purchase the six lots, each 40 x 165 feet, for $4,320.00. Mr. Isidore Masarek was elected to be the seventh member of the committee. At the request of Bishop Fitzmaurice, no actual building was to be begun until the spring of 1903. 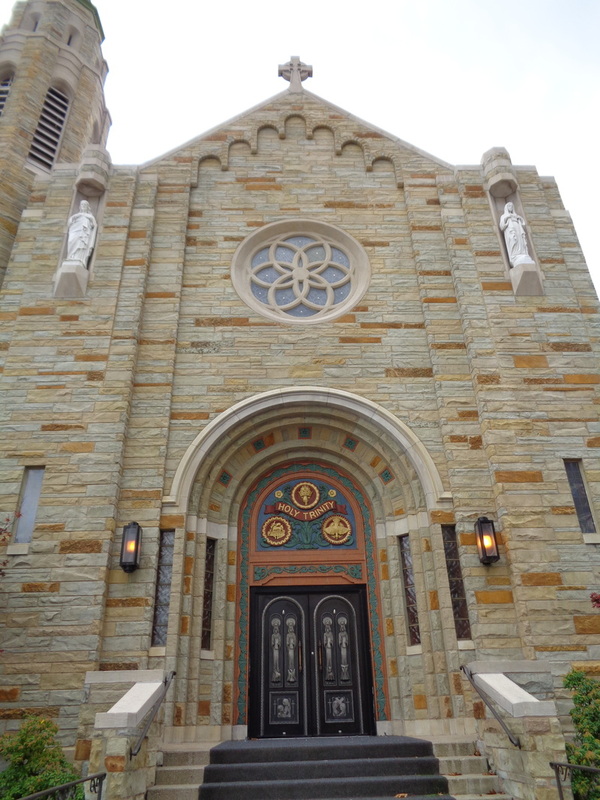 St. John the Baptist Parish had completed its new stone church, and the committee contacted the Rt. Rev. Msgr. Michael Decker to purchase the old church. St. John’s old church, with its pews, altars, bell and many furnishings, was given to Holy Trinity for $500.00. The money was advanced by Isidore Masarek, and the final transaction was completed on June 22, 1903. A stone foundation was laid, the church was moved, redecorated, and organ was purchased, a new roof was laid. Thus the first church of Holy Trinity Parish was completed at a cost of $3,062.91. The complete cost of property and church, $7,702.91, was met partially by the committee, partially by proceeds from social functions, and the remaining debt was transferred to four lots. Thus a clear deed to the land and church was presented to the Bishop. Holy Trinity Church was dedicated on December 6, 1903 by Bishop Fitzmaurice and was to serve the parish until a new structure was built in 1941. 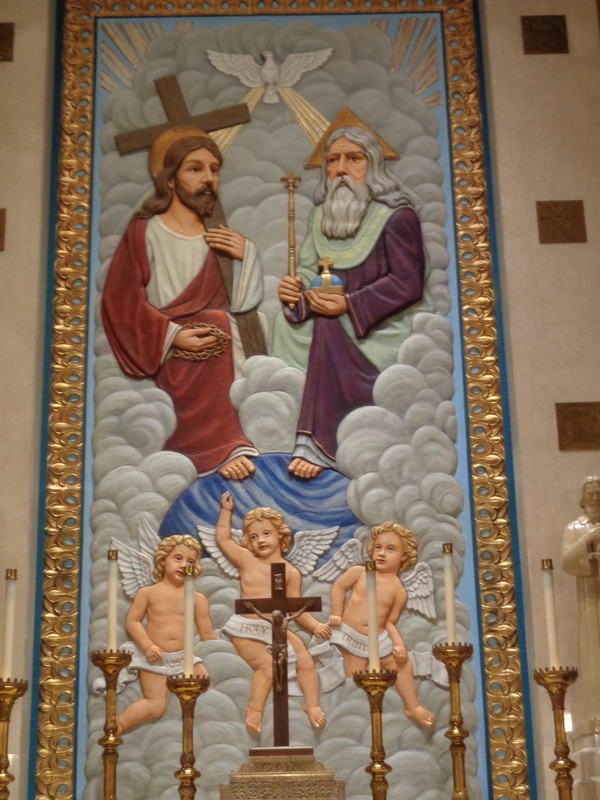 Thus the history of Holy Trinity began on the date of the church’s dedication. Rev. Andrew Ignasiak, pastor of St. Stanislaus Parish, celebrated the dedicatory Mass. The Bishop appointed Rev. Vincent Matysiak, pastor of St.Barbara’s Parish, Houtzdale, Pa., as the first pastor of Holy Trinity Church. On his appointment to Holy Trinity, Rev. Matysiak selected a church committee of three members: Mr. Adalbert Skibinski, Mr. Anthony Donikowski, and Mr. Francis Nowak. There was no rectory, and Father Matysiak had to live in a home two blocks away from the church. So plans were soon drawn up for a combination school and rectory. A suggested meeting hall in the basement, to be used when necessary for an extra classroom, was added to the original plans. On September 10, 1904, the newest addition to the parish was completed at a cost of $6,000.00. The rectory and school consisted of ten spacious rooms with an assembly hall in the basement. A week’s mission was opened on October 3, 1904. This included the forty hours devotion. Bishop Fitzmaurice blessed the new school during the course of the mission and was pleased with the progress made in such a short time. According to Waclaw Kruszka’s Historya Polska w Ameryce (A History of the Poles in America: Published in 1908), along with two missionaries the following priests came: Revs. Robaczewski, Pelarski and Niedbalski. Niedbalski was a dear friend of Father Matysiak from Texas. Quoting from Kruszka: “Toward the end of the mass, Father Matysiak, tired in the evening, went to take a bath. He did not return for a long time, and finally a moan was heard. When the bathroom was opened he was found half conscious”. Rev. Matysiak died at one o’clock on the 11th of October, 1904. The result of monoxide poisoning from a defective gas tank in the bathroom of the new rectory. Bishop Fitzmaurice offered Rev. Severin Erasmus Niedbalski the pastorship of Holy Trinity Parish. By expert financial administration the debts which were contracted during the building of the rectory and those which remained on the property were soon liquidated. A number of religious societies were founded, including the Holy Rosary Society, Our Lady's Sodality, Holy Name Society, and Holy Trinity Men's Society. A Youth Organization with a Drum and Bugle Corps was also organized, and later this developed into a patriotic and fraternal organization and consolidated with the Polish Falcons of America. Presently it represents the Polish Falcons Nest No. 123. All these societies had their beginning in the very first years of Father Niedbalski's labors. Soon it was apparent that the school which was housed in the rectory and the teaching facilities were not adequate to cope with the ever increasing registration of school children. Professor Adalbert Pryba, who was at the same time an organist, devoted his time industriously, but the amount of work was not sufficient to meet the demands of increasing classrooms and increasing student body. John Grygier, the present member of the church committee was his first pupil, and he recalls the schoolmaster days and methods of Professor Pryba with no little gusto. A new school and an increase of teaching personnel became an absolute necessity. 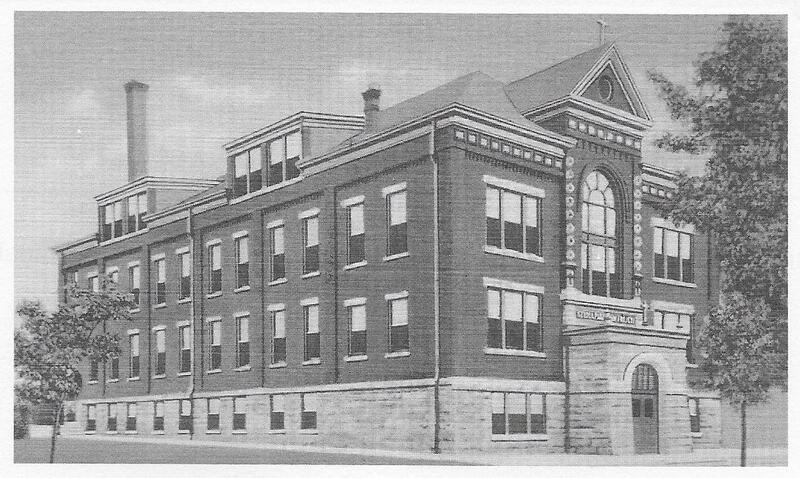 In 1909 Mr. Ladislaus Zwadzki from Buffalo, NY, presented to Father Niedbalski plans of a new school building. This building was to be modern, spacious to take care of all future needs, it was to have a large auditorium, and many classrooms. Father Niedbalski accepted this plan on May 26, 1909, excavations were started for the basement and foundations. On July 17, 1909, the cornerstone was laid. The complete cost of the present school building, including on two occasions necessary expansions of classrooms, runs well over $150,000.00. At the time of construction only the first floor was furnished for immediate use. Later as expansion was necessary, the second floor was furnished in 1914, and the third floor was furnished and completed in 1928. On this occasion there were more than 800 children in attendance. In September, 1910, the Felician Sisters from Buffalo, New York were asked to take charge of the newly completed school. Sister Mary Lucina was the first superior and her first staff numbered three sisters. The second floor of the new school was furnished to serve as the convent until further building expansion would be practical. Immediately adjoining the Holy Trinity property was a Baptist Church, standing on the corner of 23rd and Reed. After years of patient waiting, this property was acquired on May 22, 1924 for the sum of $19,000.00. The masonry of the Baptist church was solidly constructed. Father Niedbalski decided that this building could be remodeled into a rectory. The plans were submitted to Bishop John Mark Gannon and approved. On October 5, 1924, Kirschner Brothers Contractors began the necessary alterations. The exterior of the building was veneered with new brick, and the interior was completely remodeled and reconstructed. Sixteen large rooms, sleeping quarters for visiting priests to meet any emergency, studies for the pastor and assistant, visiting parlors and business offices, modern fixtures and plumbing, all these have been provided and will be sufficient for many years to come as a useful and convenient rectory. It was blessed and occupied on Holy Trinity Sunday, 1925. 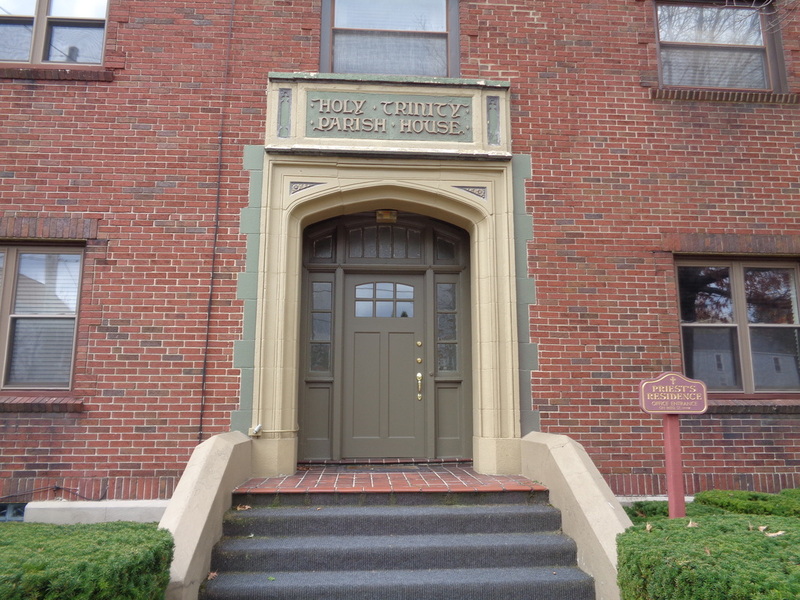 Holy Trinity Rectory was converted from a former Baptist Church in 1925. As the expansion of the parish required more Masses on Sundays, the services of supply priests were enlisted. Missionary Fathers of Divine Word from Girard and the Vincentian Fathers from St. John Kanty College labored in this field for many years. 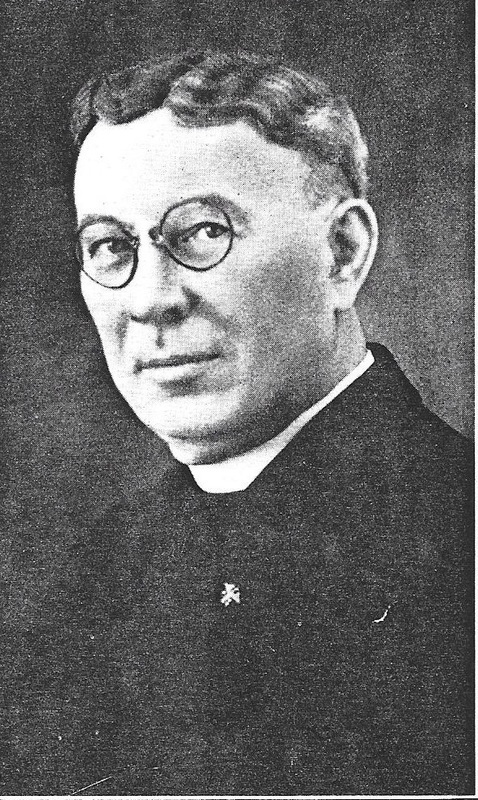 In October, 1915, Father Niedbalski was given for his assistant Rev. Thaddeus Napieralski, who remained until June of 1921. Rev. Casimir T. Nagorski was appointed assistant of Holy Trinity Church in June, 1928. He served until June 1933. In June, 1933, Rev. Joseph J. Cebelinski was appointed assistant at Holy Trinity Church. He served until 1948. As the years passed: the parish expanded, and the little frame church that served thousands of Poles in Holy Trinity Parish for two generations was soon inadequate. A new church was the dream of young and old parishioners. On Saturday March 30, 1940, Father Niedbalski, accompanied by Architect G.W. Stickle, Presented plans to Bishop Gannon for a new stone edifice which was then estimated at $80,000.00. The general contract was awarded to J.E. Kirsch, and ground was broken on April 8, 1940. It was, then, with great joy, that Father Niedbalski and the parishioners of Holy Trinity took part in the services of April 8, 1940, when the ground for the new church was broken. A number of priests assisted on this occasion: Rev. Dr. Ladislaus J. Stańczak, Rev. Stephen Długołęcki, Rev. Stephen Katarzyński, Rev. 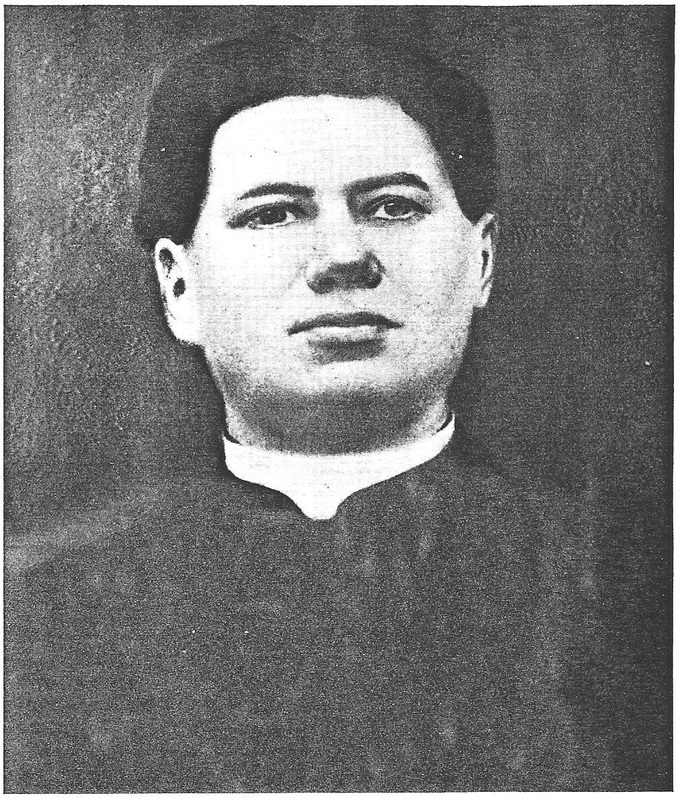 Louis Kozłowski, Rev. Albin Ziomek, Rev. Sigismund Piotrowski, and Rev. Joseph J. Cebelinski. The Architect G. W. Stickle and the General Contractor J. E. Kirsch were also present at the ceremony. Many societies and all the school children attended Mass and partook in the services. On October 27, 1940 His Excellency Bishop John Mark Gannon, laid the cornerstone. Within a year the new edifice was completed and dedicated on the appropriate date of Trinity Sunday, June 8, 1941. Bishop Gannon Blessed the church. Father Niedbalski, who had been elevated to the rank of Domestic Prelate with the title of Right Reverend Monsignor a few months earlier in April, celebrated the first Solemn Mass. While His Excellency presided in Capa Magna. Rev. Francis Robaczewski, pastor of St. Hedwig’s was deacon, and Rev. John L. Mieczkowski then pastor of Assumption Parish Oil City, was sub-deacon, Rev. Joseph J. Cebelinski, assistant at Holy Trinity, was master of ceremonies. In the evening the last services were held in the old church, for soon it was to be razed and remain only a treasured spot in the memories of the thousands who were baptized, made their First Communion, were confirmed and married there. Within a year the new edifice was being completed. The church committee was called in conference frequently. Their time and labors were of untold assistance to Father Niedbalski. The signing of all contracts the perusal of all plans, important decisions concerning new furnishings, methods of raising necessary funds, finally the whole program of dedication, all these important contributions were work of the church committee. This committee consisted of Mr. Isadore Masarek, who did not live to see his work completed, Dr. Felix Shubert, Mr. Roman Walentowski, Mr. John Grygier, and Mr. John Grenberg. The present Holy Trinity Church built in 1941. The first baptism in the new church was recorded on July 13 1941 of Christine Szymanowska, daughter of Thaddeus and Helen Szymanowski. The first marriage to take place in the new church was on June 11th 1941 between John Trochhowski and Gladys Wisniewska. On February 12, 1948, the death Rt. Rev. Msgr. Severin Niedbalski saddened the parish He died at the age of 83. Having served Holy Trinity parish faithfully for forty-four years as its pastor. He would have celebrated his golden jubilee of ordination within a few months had God not called his servant to his eternal reward. Rev. 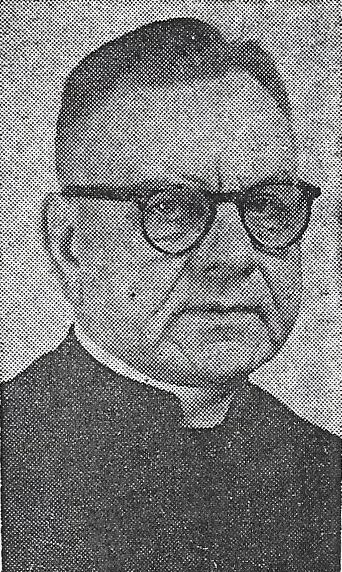 John L. Mieczkowski pastor of Assumption Parish Oil City became the third pastor of Holy Trinity Parish on February 21 1948. In November 1953 he was elevated by His Holiness Pope Pius XII, to the rank of Papal Chamberlain with the title of Very Reverend Monsignor. Monsignor Mieczkowski, known for his industriousness and administration, at once began the work which was eventually was to make Holy Trinity one of the most beautiful and complete parish units in the city and diocese. He first installed rubber kneelers in the church with stained-glass windows. 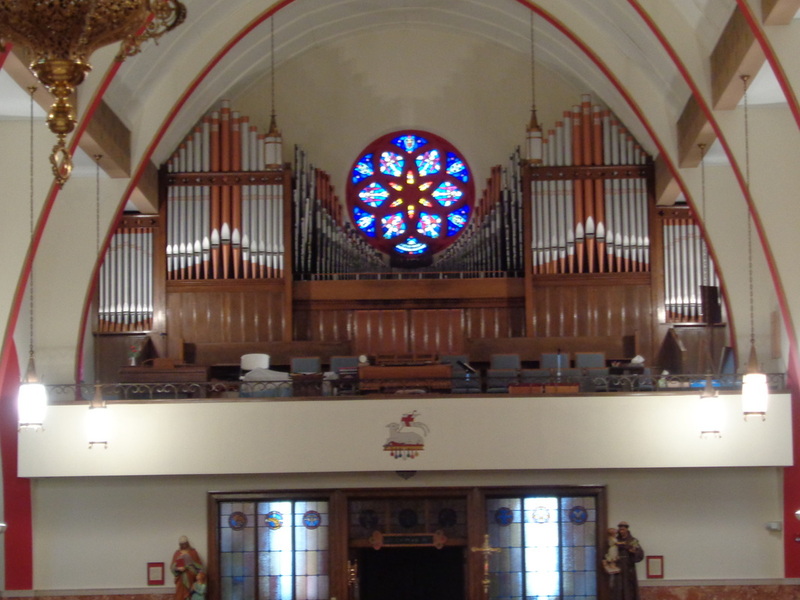 Rose Window, Organ and Choir Loft. The Sisters’ Convent, having served the parish for many purposes since 1904, as rectory, school and meeting hall, was badly in need of repairs and remodeling. The Sisters who had dedicated their lives to the education of the children of Holy Trinity Parish were deserving of a decent and convenient home. So Monsignor Mieczkowski began the reconstruction of the Convent-it was completely brick-veneered, a sun porch added, a new front was constructed, a completely new altar was installed in the chapel, the home was completely repainted, new furnishings and fixtures were added-all this was done at a cost of over $33,000.00 by contractor Joseph Ciesiak, a member of the parish. In 1950 the debt of $37,000.00 Monsignor Mieczkowski found on arrival at Holy Trinity was paid off too. In August 1951 work was begun on a grotto to Our Lady of Fatima-facing 22nd street between the church and school. It stands over 18 feet high, and was built entirely of Tennessee Crab Orchard Stone, with a stone altar and six Carrara marble statues imported from Italy. The figure of the Blessed Mother is six feet high and stands in a niche above the open tabernacle. 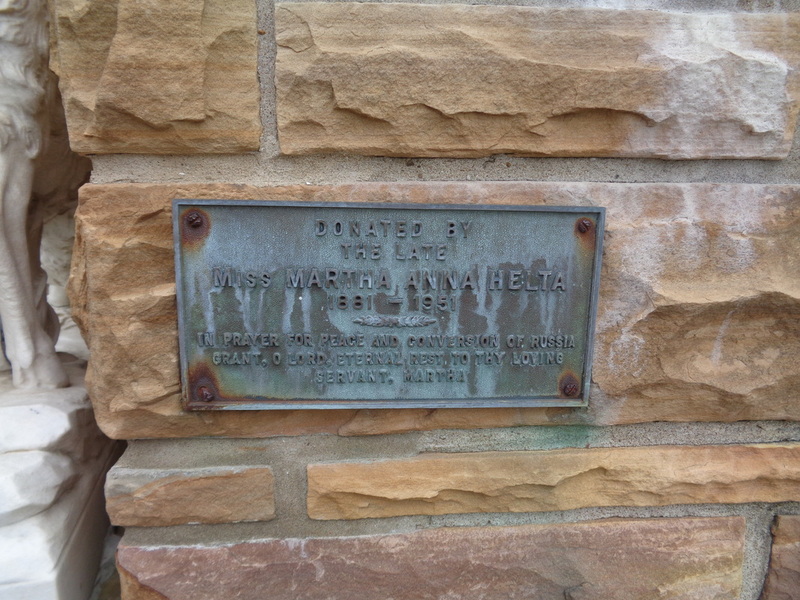 The grotto was a donation of the late Miss Martha Anna Helta and cost $10,000.00. On the completion of the grotto, a dedicatory Mass was said at its altar on the first Saturday of May, 1952 by Father Mieczkowski. 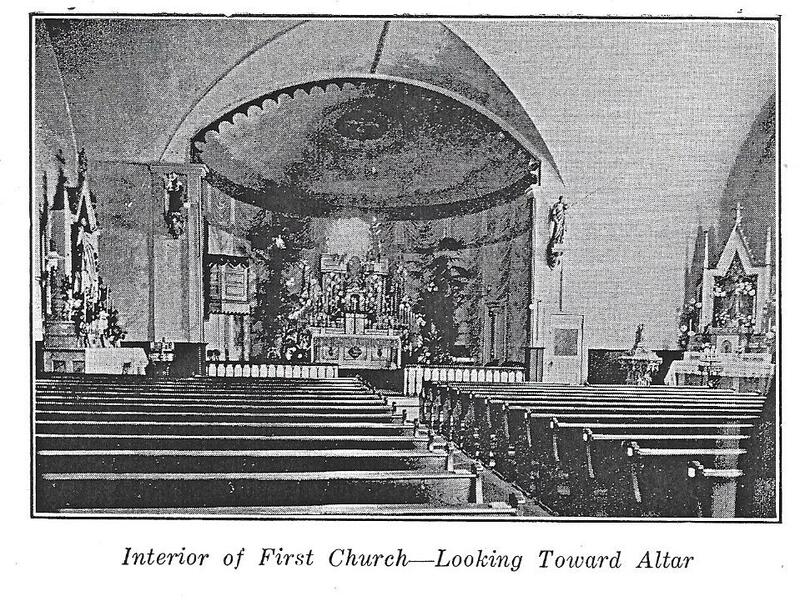 In May of 1952, the interior of the church was completely repainted by the Hans Schmidt Studios of Englewood, New Jersey. Two huge paintings, one of Christ with Mary Magdalene and Martha, the other of the Blessed mother, the Infant Jesus, St. John the Baptist and St. Elizabeth, are laced on the sanctuary wall on both sides of the altar. Pictures of the twelve Apostles were painted on the walls between each pillar in the church. This work cost $14,000.00 and was donated too by the late Miss Martha Anna Helta. 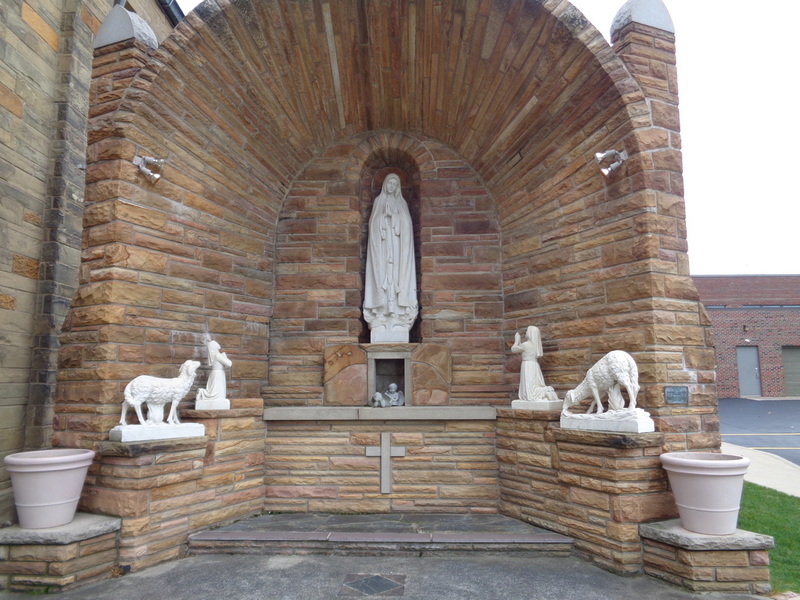 Our Lady of Fatima grotto dedicated May 1952 donated by the late Miss Martha Anna Helta. In 1952 plans were evolved to build a modern Social Center in the parish. Three lots and two homes on 23rd Street were purchased and demolished, together with an old home belonging to the parish and adjoining the rectory. In all these four lots measured 145 feet in frontage. In April, 1953 work was begun on this new addition to Holy Trinity Parish in commemoration of our golden jubilee. Mr. Henry J. Olevnik, a member of Holy Trinity Parish, was awarded the general contract. Completion was set for October of the same year. Though much of the building done in Erie suffered from a strike that summer, work on the Social Center continued with little interruption. Each week saw the building take graceful form. 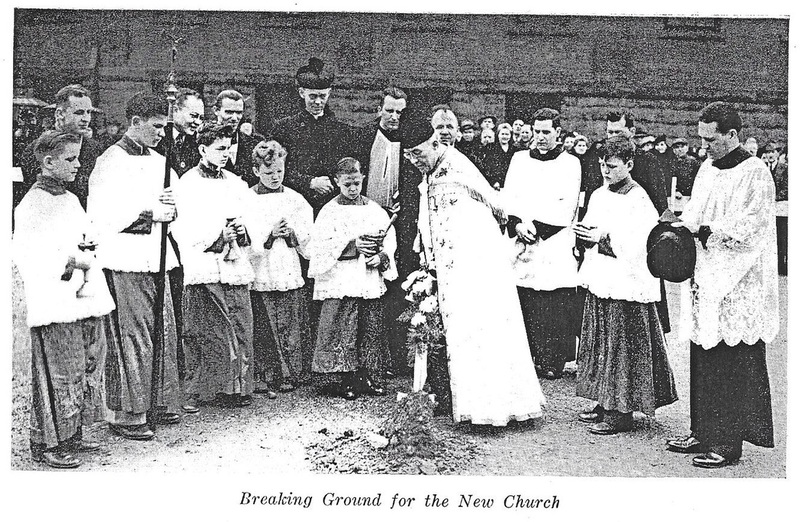 The cornerstone was laid by Father Mieczkowski in October, 1953. An insulated box, containing the history and information of the building, was cemented behind the cornerstone by the pastor, Monsignor John Mieczkowski. On November 8, 1953, Bishop John Mark Gannon, soon to be elevated to an Archbishop, blessed the building. Property purchased and construction amounted to a cost of $166,000.00--$100,000.00 of which was donated by the pastor, Very Reverend Msgr. John L. Mieczkowski. It stands as a testimony to God in gratitude for his blessings of fifty years and an addition to help the souls of our parish in their salvation. The modern gymnasium—auditorium is 133 feet by 75 feet overall and contains a floor of 90 feet by 58 feet, plus a stage with two dressing rooms, a boiler room, boys’ and girls’ washrooms, each with separate locker room and showers, and a large and well-equipped kitchen, a separate grill room, storage room, combination meeting room and checkroom, and a spacious foyer. December 6, 1953 marked the 50th Anniversary of the founding of Holy Trinity Parish. To commemorate this occasion A Solemn Mass of Thanksgiving was celebrated on May 2, 1954. On September 4, 1959, Msgr. John Mieczkowski died, and Reverend Joseph Cebelinski was appointed the fourth Pastor of Holy Trinity. On June 2, 1973, Msgr. Cebelinski retired and Reverend John Daniszewski was named the fifth Pastor the same day. Sadly, Msgr. Cebelinski died on December 28, 1973 of a heart attack. A Diamond Jubilee Mass was celebrated on May 14, 1978 with Bishop Alfred Watson as celebrant. Also, Bishop Watson was celebrant at the dedication of a new Altar on Jan 6, 1981. On June 5, 1983, the Felician Sisters of Coraopolis leave and the Felician Sisters of Buffalo return to Holy Trinity School. On October 9, 1990, the Steeple Cross was dedicated. Msgr. Daniszewski retired on August 16, 1992 and the Reverend John Santor became the sixth Pastor of Holy Trinity. An Annual Summer Festival began on August 25, 1993 as a Parish fundraiser. Reverend John Santor’s last day as Pastor was June 29, 1994 and Reverend David Maciukiewicz was appointed the seventh Pastor of Holy Trinity. Holy Trinity School was transformed into Holy Trinity School of the Arts on August 28, 1995. However, the school closed on June 13, 1997, and a Catholic Education Scholarship Program was established. The Annual Summer Festival was renamed “Zabawa” on August 28, 1998 and encompassed the entire Polish community. On June 23, 2000, a Mass was held at Trinity Cemetery to rededicate the Parish site. July 1, 2000 was also the beginning of the Holy Trinity Church Millennium celebration. In August of 2000, the association with the Felician Sisters came to an end. Also in August, Deacon Marty Eisert was appointed. June 8, 2001 was the celebration of the Church Building’s 60th Anniversary. Holy Trinity School and Convent were demolished on November 5, 2002. On September 3, 2003, Fr. Maciukiewicz took a leave of absence and the Msgr. Thomas McSweeney was appointed as Parochial Administrator. Deacon Marty Eisert was appointed Temporal Administrator. Holy Trinity Social Center completed renovations on October 25, 2003 and on December 6, 2003, Holy Trinity Parish celebrated its 100th Anniversary. Msgr. McSweeney retired at the end of June, 2014, and Fr. Tom Aleksa was appointed pastor at that time. Fr. Aleksa took a sick leave in November 2014, and Fr. Stanley J. Swacha was appointed administrator. Fr. Aleksa resigned for health reasons in December 2014. Fr. Swacha. was appointed pastor during Lent of 2015. After months of study and feedback the Diocese decided to partner Holy Trinity Church with St. Stanislaus Parish. This went into effect February 13, 2017. Rev. Msgr. Bernard Urbaniak was named the Pastor of both St. Stanislaus and Holy Trinity Parishes, with Rev. Msgr. Daniel Magraw named as associate Pastor, with residence at Holy Trinity. The Parishes will also share Deacons Robert Walker and Thomas Matusiak. Święty święty święty! Holy Holy Holy!